The year was 1840. Martin Van Buren was completing a Presidential term blighted by terrible economic depression. This era, called the Hard Times, resulted from years of reckless Western land speculation and the growth of unregulated banks issuing a flood of unsecured paper money. The prolonged depression ravaged America’s agriculture and industry and saw hundreds of thousands starving and unemployed. Inherited from President Andrew Jackson was the Van Buren Administration’s faith in “hard money”— silver and gold—as the only reliable store of value in contrast to shaky credit and worthless paper money. Expressing this hard money outlook, the Mint strove from 1836 to 1840 to create a new circulating silver dollar. No dollar coin had appeared for circulation since 1804, when the last of the 1803-dated Draped Bust dollars were released. Mint Director Robert Maskell Patterson viewed the new dollar as the pinnacle of America’s silver coinage. After all, it was a fortunate workman who made even four dollars for a work week of 76 to 80 hours of unremitting toil in this harsh era. A silver dollar was indeed a store of wealth to millions of impoverished working-class Americans. An admirer of the seated Britannia on British copper coinage, Patterson believed that a seated female figure would be just as “emblematic of liberty” as the heads and busts adorning the nation’s coinage. He engaged the great portrait painter Thomas Sully to make sketches for his seated Liberty. Sully perched her on a rock in Grecian robes, left arm supporting a Union shield with a scroll inscribed LIBERTY. Her right arm was raised and held a pole topped with a small Liberty Cap. The Mint’s assistant engraver, Christian Gobrecht, adapted the Sully sketches to bas-relief art suitable for coinage. 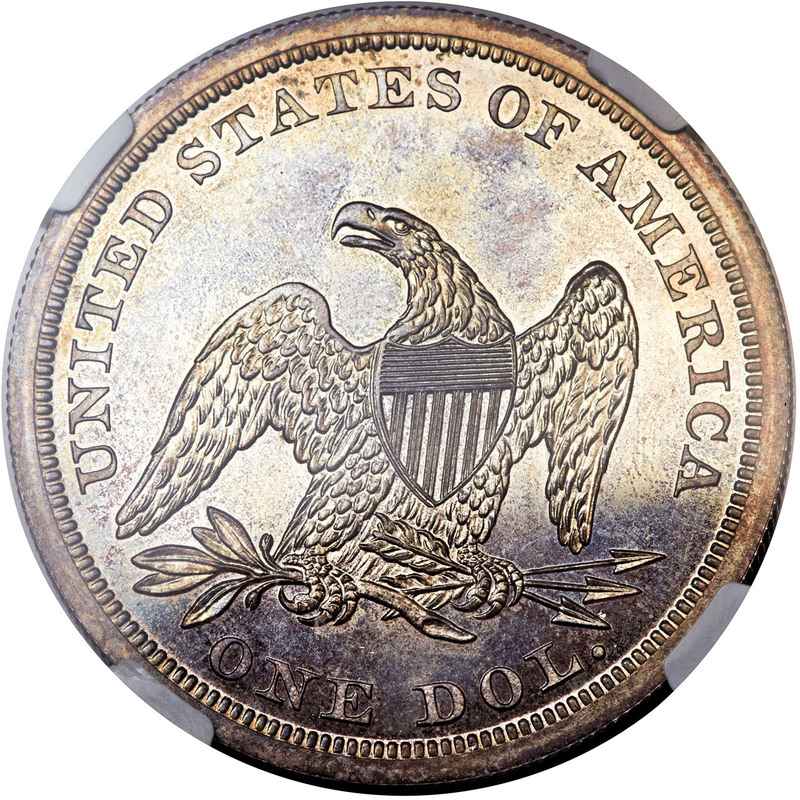 The result was the Seated Liberty design used at one time or another on half dimes, dimes, 20-cent pieces, quarters, half dollars and dollars from 1836 through 1891. As reworked by Gobrecht and Robert Ball Hughes, Liberty emerged with a rounded head and her dangling right arm appearing immensely long, her left markedly shorter. Pattern obverses of 1836 and 1839 showed no obverse stars but placed the artist’s signature in the field or on the base. Gobrecht’s original reverses of 1836-1839 presented a magnificent flying eagle in a starry or plain sky. Unfortunately, the “No Motto” silver dollar of 1840-1865 deleted the innovative flying eagle, substituting the unimaginative but familiar “sandwich board” bird with dropped wings and a shield on its breast. Liberty had no artist’s signature and sat demurely in a circle of 13 stars with the date placed below. The coins of 1840-65 do not have the motto IN GOD WE TRUST on the reverse. Mintages were generally small by modern standards, totaling only 2,895,673 coins for the series. The Philadelphia Mint (no mintmark) struck all dates from 1840 to 1865 inclusive; New Orleans (O), struck dollars dated 1846, 1850, 1859 and 1860; the San Francisco Mint (S), struck this type dollar only in 1859. Mintmarks are located under the olive branch, between the eagle’s feet on the reverse. Tiny numbers of proofs were struck of most early Philadelphia dates, but they are of great rarity. Numbers struck are not known with certainty and are omitted from popular guide books. Proofs were first made for public sale in 1858 when perhaps 80 pieces were struck; later proof mintages never exceeded 1,000 except for 1860, when 1,330 pieces were coined. Proof restrikes were made of the 1851 and 1852 coins. The last No Motto date was 1865, with 46,500 business strikes and 500 proofs made. Two 1866-dated No Motto coins are known, but these “fantasy pieces” were made somewhat later for sale to wealthy collectors. In recent years, the existence of a single proof 1851-O specimen has come to light, though researchers postulate that this was accidentally made by the Philadelphia “Midnight Minters,” (probably engraver George Eckfeldt and his son, Mint night watchman Theodore). In their haste to clandestinely supply the coveted 1851 issue, they overstruck an existing New Orleans Mint dollar, the flattened ‘O’ mintmark still being faintly visible. These large silver coins had some odd striking characteristics. The actual position of Liberty’s head may cause poor detail even on pristine specimens. The feathers on the eagle’s leg and the claws may also show evidence of weak strike. Wear first appears on Liberty’s thigh, right breast and the top of her head. The tops of the eagle’s wings follow. Because of their size and weight, uncirculated coins stored in Mint bags will show scattered contact marks. Proofs often are hairlined from the careless handling of early non-numismatic owners or will show evidence of cleaning by old-time collectors. Seated Liberty dollars have gained popularity with the entire collector community since the 1970’s, when the great U.S. Treasury hoard of silver dollars was liquidated, though few of this early type were found. To collectors more familiar with Morgan and Peace dollars issued in the tens of millions, these earlier coins may seem scarce and elusive, and indeed they are. Only a small minority of all Seated Liberty dollars struck remain in existence today. Researcher Weimar W. White estimated that just a fraction survive—even in low grades. Assembling a complete date and mint set in lower circulated grades is within reason, given patience and perseverance. An entire set in mint state will be costly, especially for examples of the 1850-O, 1851, 1852 and 1859-S. A complete run of proofs is a theoretically possible goal but one which will be unrealistic for any but the best-financed collector. The Seated Liberty series continued from 1866 to 1873 with the reverse motto IN GOD WE TRUST. The coinage act of Feb. 12, 1873 discontinued the silver dollar and abolished the legal tender status of all silver dollars struck from 1794 to 1873. This is the law later savagely denounced by the vocal partisans of free and unlimited coinage of silver as the “Crime of ‘73.” Legal tender status was restored to the standard silver dollar under the Bland-Allison Act of 1878, which prompted the coining of millions of Morgan Dollars. Almost immediately, Pollock struck a few patterns and forwarded them to Chase. In his accompanying letter, Pollock asserted that the first suggestion for this religious motto, “Our Trust is in God,” had too many characters to fit comfortably. The Mint Director recommended “God Our Trust” since he felt it carried the same idea and was more concise. He also preferred the motto to be placed on the reverse above the eagle, within a scroll or ribbon device as an artistic backdrop. Pattern half dollars and eagles dated 1861 and 1862 have the words GOD OUR TRUST. From 1863 through 1865, additional patterns were made using GOD OUR TRUST, GOD AND OUR COUNTRY, and IN GOD WE TRUST. It was IN GOD WE TRUST that Secretary Chase finally approved in 1864. It first appeared on the two-cent piece in that year and then later on the Shield nickel in 1866. Patterns dated 1865 with IN GOD WE TRUST were made of the double eagle, eagle, half eagle and the silver quarter, half dollar and dollar. Ultimately, the Mint Act of March 3, 1865 provided the authorization for use of the motto on the regular silver and gold issues. 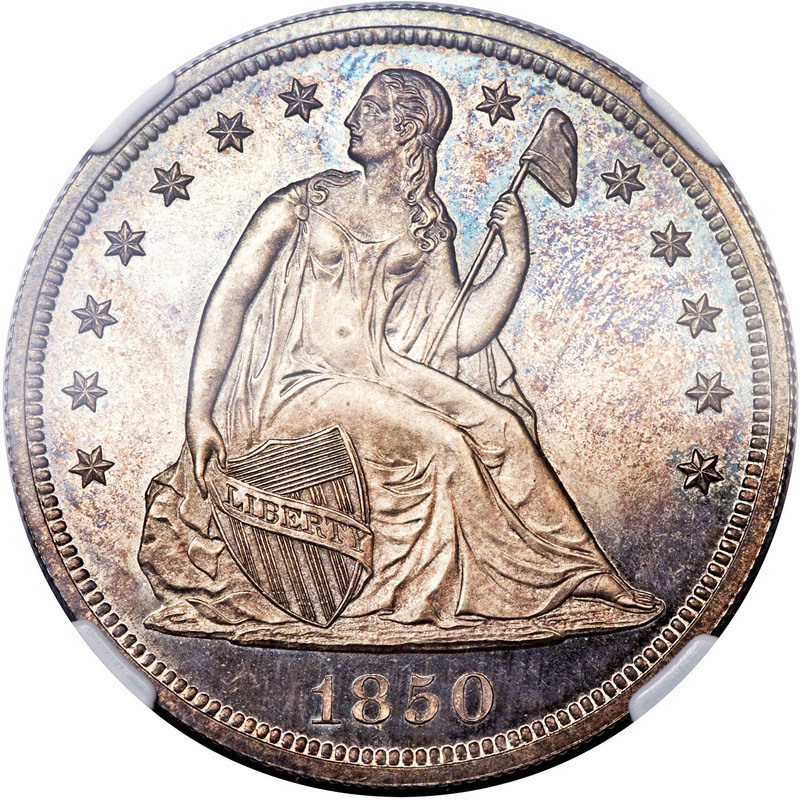 The Seated Liberty dollar of 1866, identical to previous issues except for the addition of the motto, was based on the original design by Christian Gobrecht, the former Chief Engraver of the Mint. First used on regular issue coins with the 1837 dime, it was applied to the dollar in 1840. The design depicts Liberty seated on a boulder. She is holding a pole in her left hand topped with a liberty cap. With her right hand she supports the shield of the union inscribed with the word LIBERTY. Thirteen stars surround the figure. The reverse features an eagle with outstretched wings and the Union shield on its breast. The eagle is grasping an olive branch and three arrows. The legend UNITED STATES OF AMERICA appears in a semicircle around the eagle, and the denomination ONE DOL. Appears below. If a particular coin has a mintmark, it is directly under the eagle. The design has powerful symbolism. With the use of the liberty cap, it declares freedom. The union shield is symbolic of the unity of the nation. In the throes of the worst conflagration this country ever experienced, it was natural for the people of the mid-19th century to turn to the deity for help and guidance. Placing a religious sentiment on something as familiar as a coin was the equivalent of a national prayer. The motto has become very much a part of the American psyche. This was evident when the double eagle and eagle were issued without the motto in 1907. It caused an immediate public controversy, and Congress ordered the motto restored in 1908. Although “With Motto” dollar mintages were small, the coins were well used by the public. This accounts for the small number of uncirculated pieces that exist. Only about 3.6 million pieces were minted for circulation. The majority were made at the Philadelphia Mint with only two branch mints producing the With Motto type. Of the Carson City Mint issues of 1870, ‘71, ‘72 and ‘73, the 1870-CC is the easiest to locate. There are also three San Francisco issues. The 1870-S is a major rarity, and the 1873-S, with a reported mintage of 700, is unknown in any collection. That leaves the 1872-S as the only collectable With Motto dollar from that mint. The Philadelphia issues of 1871 and 1872 are the dates most often seen and are popularly collected as type examples. There are 15 regular and eight proof issues of the Seated Liberty With Motto Dollar. A total of 6,060 proofs were coined, and these are spread over each date from 1866 through 1873. When grading Mint State pieces, note that this coin often comes with some parts of the design softly struck and may have many “bag” marks and abrasions. Check the high points of Liberty’s right leg and breast and the hair above her eye for signs of wear. Seated Liberty dollars may be seen with a deep patina that can range from lightly mottled to black. Heavily toned specimens should be carefully evaluated to determine whether evidence of circulation is hidden underneath. Numismatists generally collect this coin as a “type”, because it is difficult to find affordable examples of many dates in this series. A basic collection would have an example of the No Motto and With Motto types. One could also include an expensive, but obtainable, Gobrecht pattern or circulation issue of 1836-1839. But no matter which type, grade or date you own, any Seated Liberty dollar is a numismatic treasure. In February, 1873 Congress passed the Coinage Act later known as “The Crime of ‘73,” which effectively demonetized silver and put the nation on a gold standard. It would fuel intense debate for the next quarter century. While the Act created a new trade dollar for use in commerce with the Far East, it abolished the regular issue silver dollar, along with the two-cent piece, the silver trim and the half dime. The standard silver dollar would not return until 1878, when it reappeared with a new design named for its creator, Chief Engraver George T. Morgan.